At the end of October, lecturers from the Faculty of Mass Communication, Philology and Political Science at Altai State University made a long-awaited trip to Osh in Kyrgyzstan in order to support the Russian Language federal target program. The trip was aimed at organizing the second round of the international competition on the Russian language, literature and culture for pupils and students of Central Asia, Mongolia and China. The first round was held last year here and gathered more than 150 participants: they were pupils and students of Osh. Despite its small size, the city has five higher education institutions. The selection of applicants was not limited by any framework. The competition assignments were diverse and were aimed at assessment of not only the knowledge of the Russian language. The purpose of the competition was the development and popularization of interest in Russian culture in its various aspects: customs and traditions, Russian history and folk tales, proverbs and sayings, works by famous Russian writers. Pupils and students of the remote Kyrgyz city of Osh completed written assignments that were later checked and evaluated by the lecturers of Altai State University, on the basis of which the lists of participants who made it into the second round of the competition and who deserved prizes and gifts from organizers were compiled. 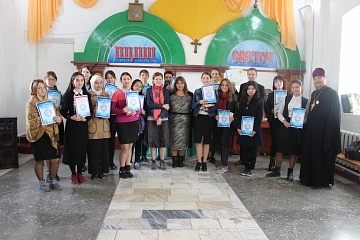 The second round was carried out in two places: at the "Svetoch" Russian Orthodox school (Osh) for pupils and at Osh State University for students. The second round was held in two stages. It was attended by 65 people. At the first stage, the participants wrote essays on the proposed topics, and later the authors of the best works were invited to an oral interview within the framework of the competition and showed their knowledge of Russian culture, history and traditions in a personal conversation with the lecturers. As a result, the winners who took the first, second and third places and received diplomas and well-deserved awards (books, dictionaries, players and tablets) were selected. The organizers received unforgettable impressions of the event. “First of all we were struck by the "vitality" of Russian culture: the Russian expat community in Osh city is about 2% (Kyrgyz and Uzbek parts of the population are about the same, 49%), but even in such conditions Russian-speaking families continue to consider themselves truly Russian, read Russian books and Russian press, study Russian history. The program of the "Svetoch" school practically coincides with the usual school curriculum of Russia with one exception: at the school they study the Kyrgyz language as the state language of their country. The "Svetoch" school is unique for the city. Despite the fact that it is Orthodox, there is no strict requirement for the religious affiliation of its pupils here: all those who wish, regardless of confession and nationality, are accepted, the only requirement is that teaching is conducted in Russian and the children get acquainted with the basics of Russian Orthodox culture. Due to this fact the school is popular in the city, has solid reputation, and many parents are happy to send their children there. At the university we were impressed by the combination of two cultures – Uzbek (predominantly Muslim) and Kyrgyz (secular). In one audience we received participants of the competition dressed in completely different clothes, brought up in completely different traditions, but friendly and, what was significant for us, studying the Russian language with equal interest. The Russian language is taught in Kyrgyz schools, but it is studied only for one hour a week, which is certainly not enough for those who want to speak Russian well. However, this problem is solved by the fact that many people know and understand Russian since Soviet times, while others travel to Russia for trade and business. Advertising on city streets is bilingual: in Russian and Kyrgyz. Many residents of the country, at least in the city of Osh, are bilinguals, equally proficient in both Russian and Kyrgyz,” the lecturers of Altai State University said. In addition, within the framework of this visit, a conference for teachers of the Russian language was organized and held. The most impressive was a meeting with teachers of the Russian language organized by Rossotrudnichestvo (an organization within the Russian Consulate in Osh): the teachers talked about their problems, methods and techniques they use at the lessons in Uzbek and Kyrgyz schools of the city. Of course, there is not enough time devoted to learning the language, there are not enough manuals and materials on the Russian language. But each teacher offers their own methods of solving existing problems. The exchange of such priceless experience was the most important goal of the conference. Lecturers from Altai State University presented reports on the methodology of teaching the Russian language, as well as held a presentation exhibition of new methodological and educational literature on the Russian language with the subsequent transfer of the books to the Russian Center, Rossotrudnichestvo and schools of Osh for further use by all interested participants of the conference. The work of ASU lecturers was highly appreciated by Rossotrudnichestvo.